Diamonds may be beautiful, but they aren’t for everyone. When shopping for an engagement ring, it is important to consider the specific woman when choosing a specific ring. For some women, a crimson ruby stone in the center of their engagement ring setting might be even more special than the standard diamond solitaire so many receive. For some grooms, the fiery ruby may better symbolize his love than a clear, colorless diamond ever could. There are many reasons to consider a ruby (or other stone) instead of a diamond for their center engagement ring stone. Whatever the reason, for those who have decided on a ruby engagement ring, the following information may be helpful. When choosing a ruby engagement ring, as with any expensive ring, size is an important consideration. Some modern brides may actually go with their grooms to choose a bridal set together, which includes the engagement ring and the wedding band. If this is the case, sizing the bride-to-be for her ring won’t be a problem. However, many couples still begin their engagements with a surprise ring chosen by the groom, seen by the bride-to-be for the first time when he proposes. So, just how can a man determine his bride-to-be’s finger size without spoiling a surprise proposal? If a quick phone call to the future in-laws or the bride’s best friend isn’t possible, keep reading. Asking is one way to find out her ring size, and shopping together for a “decoy” ring, such as a pretty, but inexpensive Valentine’s Day or birthday gift, is another. Coming up with a crafty approach may be difficult, but determining the correct ring size before purchase is an essential step in the engagement ring buying process. Once size has been determined, consider style. Would the bride-to-be rather have a simple ruby stone, or a ruby surrounded by drop diamonds? Does the bride have a cut preference? Is size a big factor? It is also imperative to find out whether the intended bride prefers platinum, silver, yellow or white gold, or has any other specific ideas about her ring. Once these questions are answered, it will be much easier to go shopping for a ruby engagement ring. There are many types of cuts to consider when choosing a ring. A squared-off Emerald Cut is stunning and elegant, while a Round Cut is sweet and demure. Some ruby engagement rings will feature diamond side stones; some will not. Beauty is entirely in the eye of the beholder, and only the groom (with help from the bride, preferably) can decide what style ring is right for his fiancée. There are several options for buying fine jewelry, including ruby engagement rings. Local, family-run jeweler counters can often offer special price deals and will take the time to help a customer find exactly the right ring for them. Many jewelers can also craft or commission custom, natural ruby engagement rings, as well. Some of the larger, chain jewelers, such as Kay Jewelers, offer mostly lab-created rubies and none are specifically set in engagement or bridal settings. Shopping online for a ruby engagement ring is another option. On web sites such as Amazon.com, consumers can browse photos of many styles of rings, and can verify a seller’s reputation before purchase. Amazon.com also offers quality assurance and buyer’s protection; see site for details. Prices on ruby engagement rings will vary depending on setting material, cut and quality of the ruby, and whether or not the ruby is a natural stone. Prices for a natural ruby engagement ring with a stone of one carat or more will likely range from as little as $600 to as much as $1200 or more. Again, jewelry prices can vary greatly based on a number of factors, including place of purchase and nature of the stone. Those in the market to create a custom ring may find a better deal on price by purchasing a loose ruby of their choice, and then bringing the stone to a jeweler to be fit into a custom setting. Choosing a white gold band instead of the more sophisticated platinum can also save the buyer a lot of money; perhaps as much as two-thirds of the total cost. Consider, however, that a platinum band will require far less in the way of refinishing over its lifetime. Another way to save money on a ruby engagement ring is to not buy a ruby “engagement” ring, at all! 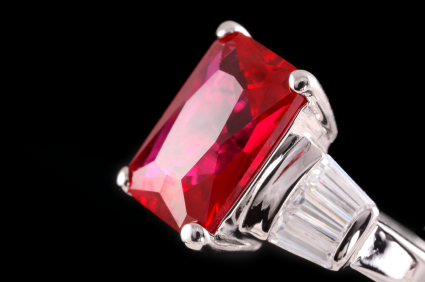 Simply find any ring that meets personal style requirements and that features a ruby center stone, and buy it. Many stores mark up engagement or bridal sets simply because they know they can; it doesn’t mean the rings in the ‘gemstones’ section of the store are any less nice! Hi what would Ring advertised in advert cost,,, Size O.